The Utah Highway Patrol is seeking applicants to fill positions on the Motor Vehicle Safety Inspection Advisory Council. Members of the seven person council are appointed by the Commissioner of the Utah Department of Public Safety. advise the division on other motor vehicle safety inspection issues as requested by the superintendent. *** Those interested in consideration for these positions must make written request via email to Lt. Matt Spillman at mspillman@utah.gov . The specific position being applied for should be noted, in addition to providing a resume or equivalent documentation of qualifications. The deadline for application is April 1, 2019. The mission of the Safety Inspection section is to provide professional police services, improve safety on the state’s highways, and protect the constitutional rights of all people in Utah. Our goal is to help reduce the number of vehicle collisions by working to ensure that motor vehicles in Utah are in safe operating condition. Inspect motor vehicles involved in fatal collisions. Approve new safety inspectors and safety inspection stations. Investigate complaints related to safety inspection stations and inspectors. Conduct proactive enforcement of safety inspection rules and laws. As of January 1, 2018 a vehicle Safety Inspection is no longer required for most vehicles to be registered or to renew the registration. Vehicles are still required to be in compliance with state laws related to vehicle equipment and vehicle Safety Inspection standards in order to be orerated on Utah’s roads. Salvage Vehicle: If a vehicle is going to be registered as a salvage vehicle, it will need to pass a Safety Inspection the first time only it is registered as such. Street-Legal ATV: Any size street-legal ATV will need to pass a Safety Inspection the first time it is registered as such and each time it changes ownership it will need to pass a Safety Inspection to be registered. Commercial Vehicle: A commercial vehicle 10,001 or more GVWR or GCWR will need to pass a Safety Inspection annually and display a Safety Inspection certificate/sticker. An annual federal inspection will also meet this requirement. School Bus: A school bus will need to pass a Safety Inspection annually and display a Safety Inspection certificate/sticker. This is a separate inspection than those conducted in the spring and fall by the Utah Highway Patrol. Bus or Van for Hire: These vehicles will need to pass a Safety Inspection annually and display a Safety Inspection certificate/sticker. Taxicab: Taxis will need to pass a Safety Inspection annually and display a Safety Inspection certificate/sticker. Three or More Axles: A motor vehicle with three or more axles, pulling a trailer, or pulling a trailer with multiple axles. 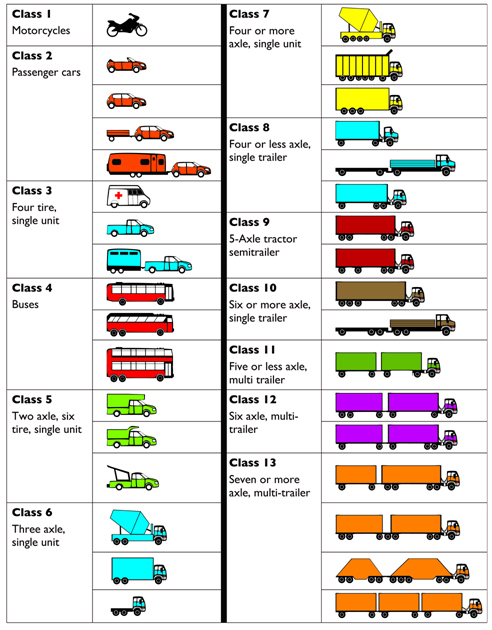 Any “Class 6” to “Class 13” type vehicle or combination (including a trailer) described on the chart below will need to pass a Safety Inspection annually and display a Safety Inspection certificate/sticker. Motorhomes with three axles are “Class 6” vehicles. Pickup trucks, including those with dual rear wheels, are not in the “Class 6” category. $7.00 for motorcycles and street legal ATV’s. $15.00 for cars, trucks, trailers, and buses. $20.00 for four-wheel drive, split axle, and any motor vehicle that requires disassembly of the front hub or removal for the rear axle for inspection. For more information about Safety Inspections call the Utah Highway Patrol at (801) 965-4889. Vehicle emissions tests are required in Cache, Weber, Davis, Salt Lake, and Utah Counties. Please contact these county governments for information regarding emission testing requirements. Safety Inspection is required by Utah law to investigate all complaints regarding state inspections. If you have questions regarding an inspection please contact the Safety Inspection office at (801) 965-4889. Action will be taken against any station that attempts to pass vehicles in violation of Safety Inspection rules. Safety Inspection also investigates complaints regarding unnecessary repairs.